The PCB design program was switched from Eagle to KiCad. 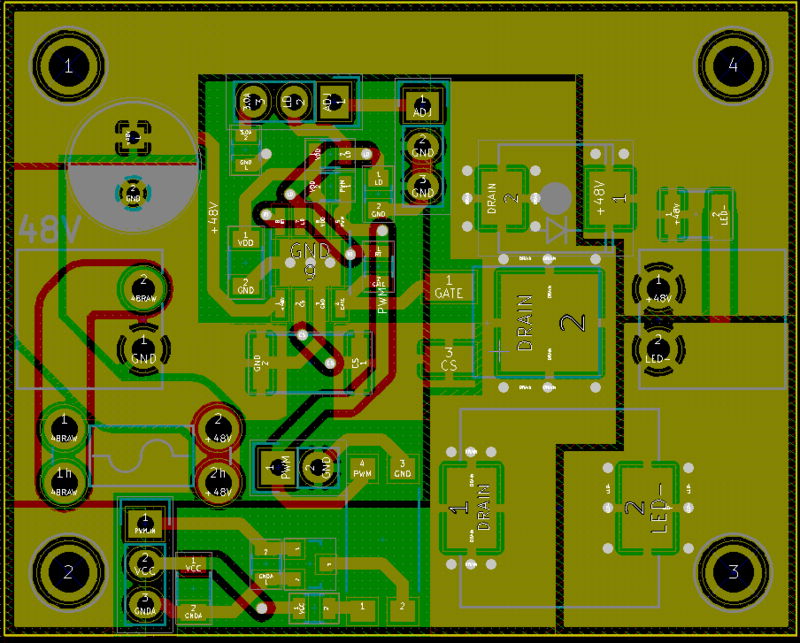 KiCad was not too hard to get used to. I switched from Eagle. The board size limitation of 50x50mm was limiting, especially when I would be making my own boards. The hotkeys took some time to get used to, but in the end, I found them to be quicker and easier to remember than the Eagle hotkeys. I could have switched them around in Eagle but I was too lazy and kept the defaults. The split modules of KiCad, Eeschema, PCBnew, CvPCB, also had a learning curve associated with them, but it did not take long to be comfortable with them. I like how the symbol and the component footprint are separate. This leads to much less switching around footprints. I lay out the general form of the schematic first, followed by component value selection, finally picking the footprint/heat-dissipation. It fits pretty naturally. I run PCBnew after running CvPCB to pick component footprints. PCBnew is easier to learn since the short-cut keys were are already fried in my head. I find it to be superior to Eagle. It is a really clean interface. I have not yet tried the automatic component placement. It looks like a nice feature for complex digital boards. It also comes with an auto-router. After the PCB was designed, a prototype PCB was etched out of scissor cut copper clad. This was my first etch I have done. The results are better than expected. The etching detailed down to about 10 mils looking at the picture below. The via holes are 0.6mm. I have included a 1/4 watt resistor for reference. More about my etching technique soon. There is a slight ~8mil registration error of the layers. This PCB is going to get drilled using a Dremel Workstation using carbide PCB cutting bits. The drills will have water flowing over them to reduce the chance of fiberglass dust being released.